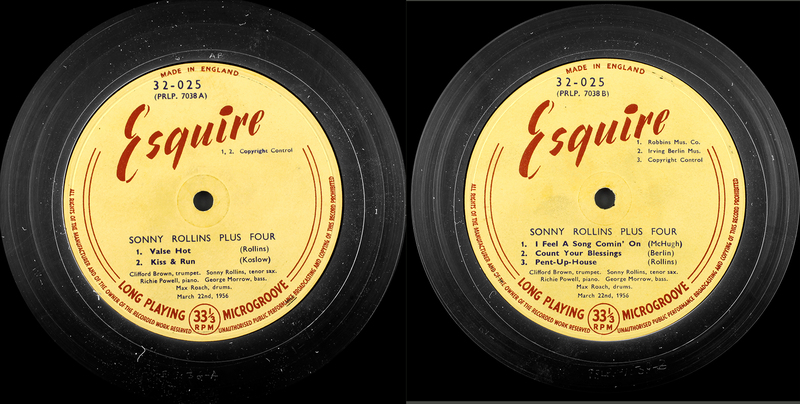 Vinyl: Esquire 32-025 1st UK release of PRLP 7038 somewhere around 1956-7 Also reissued at other times under the eponymous title “Three Giants”. Obviously poor George Morrow didn’t earn the soubriquet “Giant”, or Ritchie Powell. 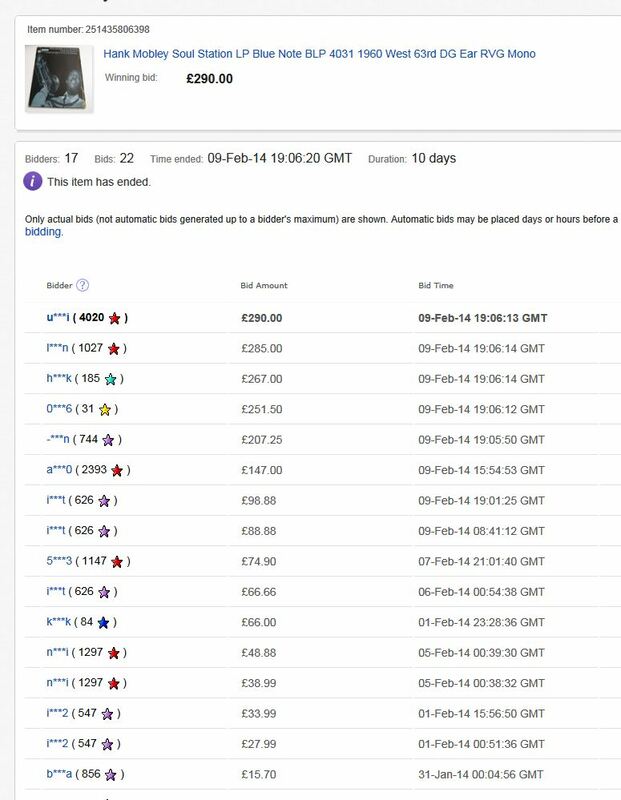 It’s an Abbey Manufacturing master (AB) Collectors Corner Blogging’s been a little light of late, no excuse really, but a complete lack of incoming Ebay wins, a laptop that has now spent four weeks of its short life under warranty repairs, and a major hifi upgrade. I know that gets no sympathy, but I’ve been busy. Normal service will be resumed – shortly. The laptop is back and stable for the first time, the new valve-based pre-amplifier is installed and running in – and already sounds stunning, and who knows, may be this weekend we get lucky on Ebay. 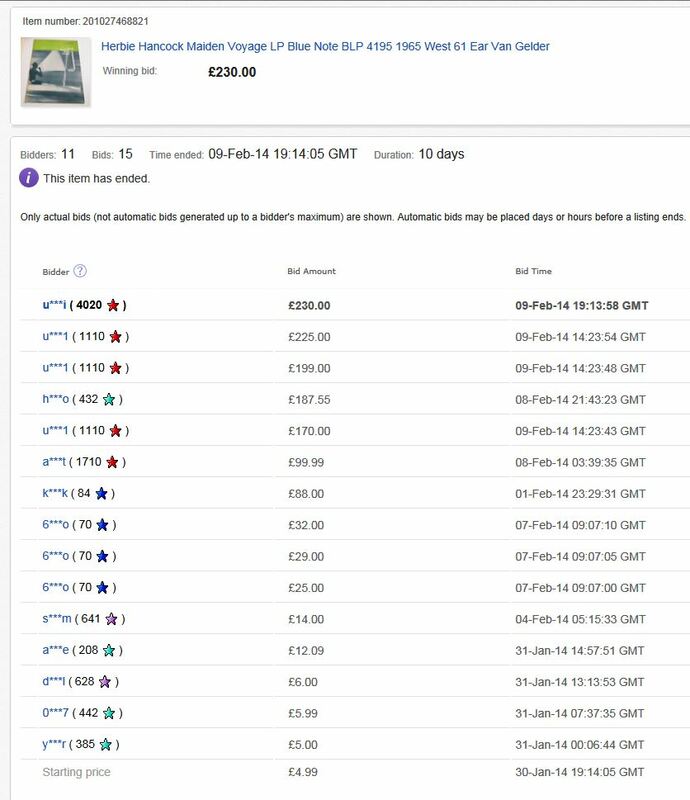 Not like last weekend, when a dealer u***i (4020) was out in force plundering auctions in UK, Germany, France and Italy, scooping everything with XXL bids, including these three Blue Notes I had eyes on: u***i (4020), who has stolen countless auction I had what I thought were realistic bids – though apparently not enough. The competing bidders here are no lightweights – scores in the range 400-800. A score over 4,000 is a dealer LJC, wrong again. A completist by her own admission, who has doubles and triples of some titles. 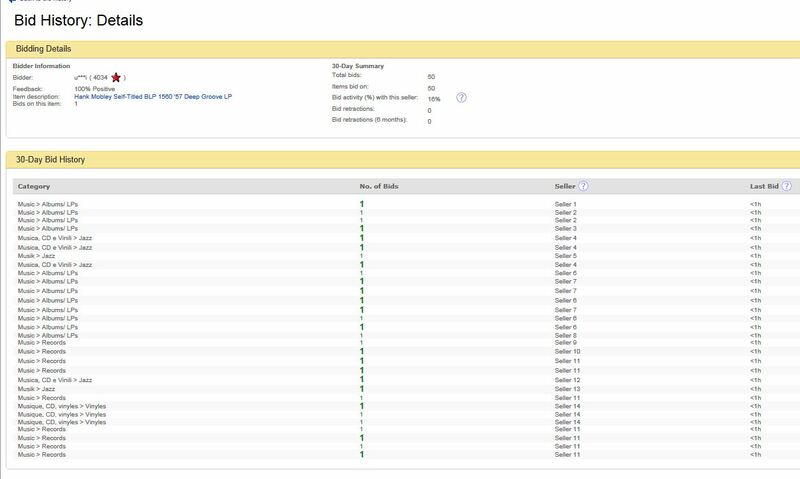 There are only 800 titles in the Blue Note catalogue so that score of 4,000 records on Ebay is way in excess of “topping up” an already existing collection of Blue Notes, even after allowing for mono and stereo editions. Who would have thought it. A lady who likes to shop – for Blue Notes – which she does by placing XXXL snipes, ensuring a winner every time. She clearly likes to win, and in consequence, everyone else loses. Certainly an unexpected explanation for a string of losses by LJC. 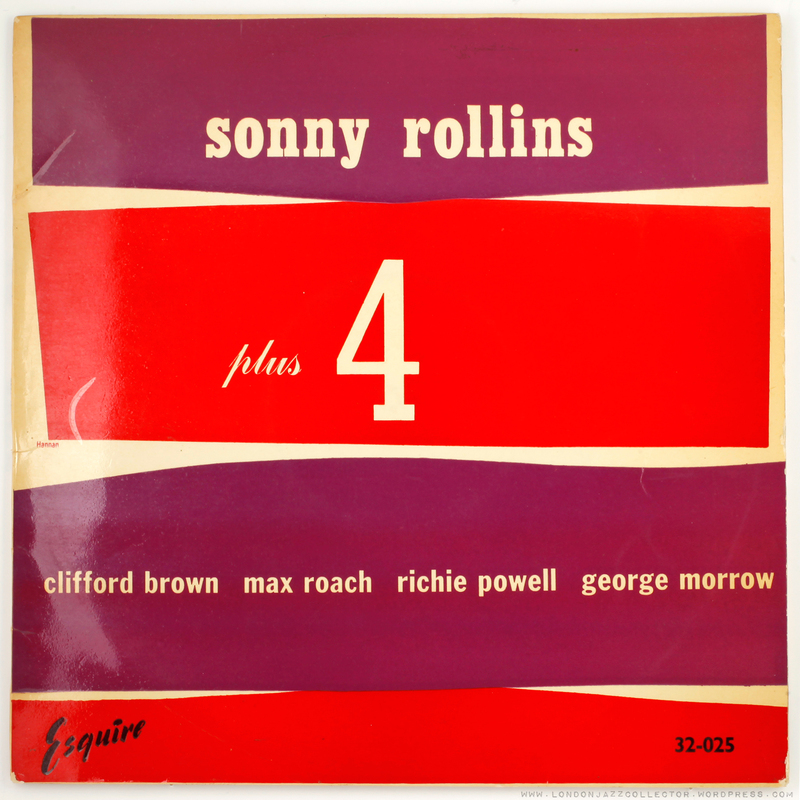 This entry was posted in eBay, Esquire, Sonny Rollins and tagged Clifford Brown, Esquire, George Morrow, Max Roach, Richie Powell, Sonny Rollins by LondonJazzCollector. Bookmark the permalink. 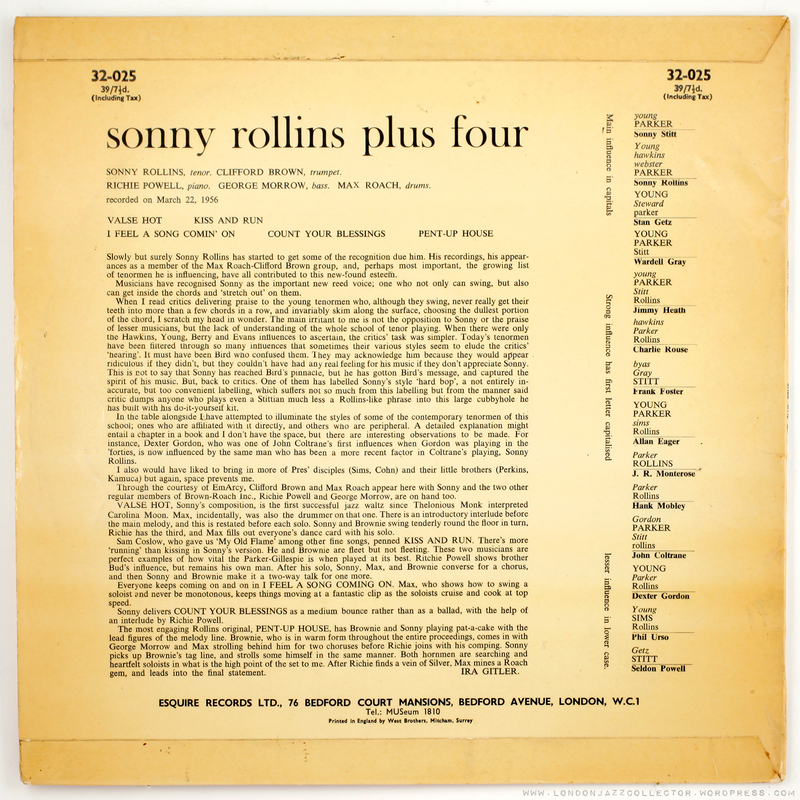 There’s a short track without Brown, “Count your Blessings” – another example of Rollins; ability to find tunes not usually recorded by jazz musicians – and it’s a great track. I was interested in buying a copy of this Sonny sometime ago, but got distracted. This blog has me back in the hunt. However, the only reasonably priced copy currently selling in the States is listed for $76 on Ebay, and it is a reissued 45rpm AcousTech (the seller just lower the price from $99). I am also watching an Esquire copy on Ebay and located in Edinburgh, United Kingdom. The current bid is $57US with 4 days left. I don’t expect to win that one, but will keep watching. I don’t have any Esquire copies of anything in my collection, so this would be a real catch. BTW, if anyone is interested, a new OJC reissue is scheduled for release at several of the online dealers here in the States at an asking price of ~ $15 – 17US. I currently have a CD of the recording, so I am not interested. I don’t personally consider OJC copies of anything a collectible item, but like a CD copy, they will do in a pinch. 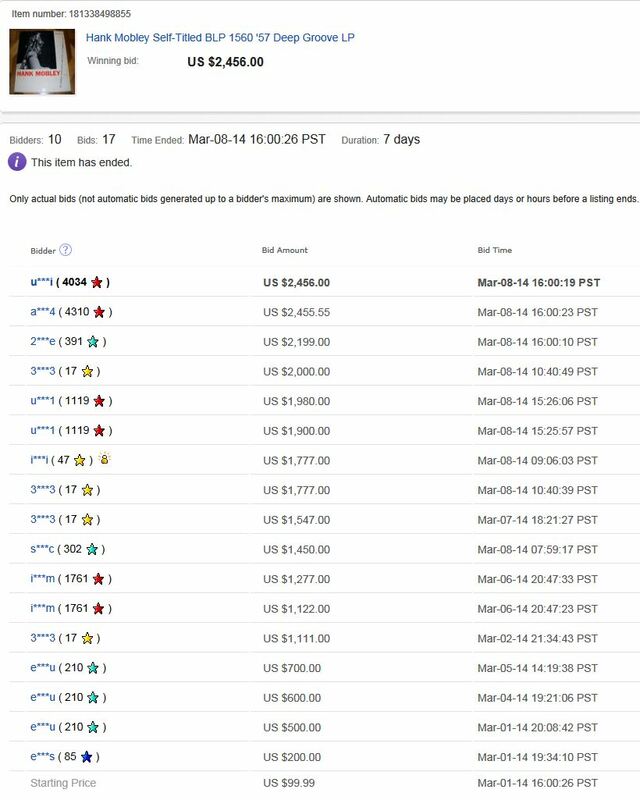 3**3 keeps winning a lot of the auctions I’m watching. 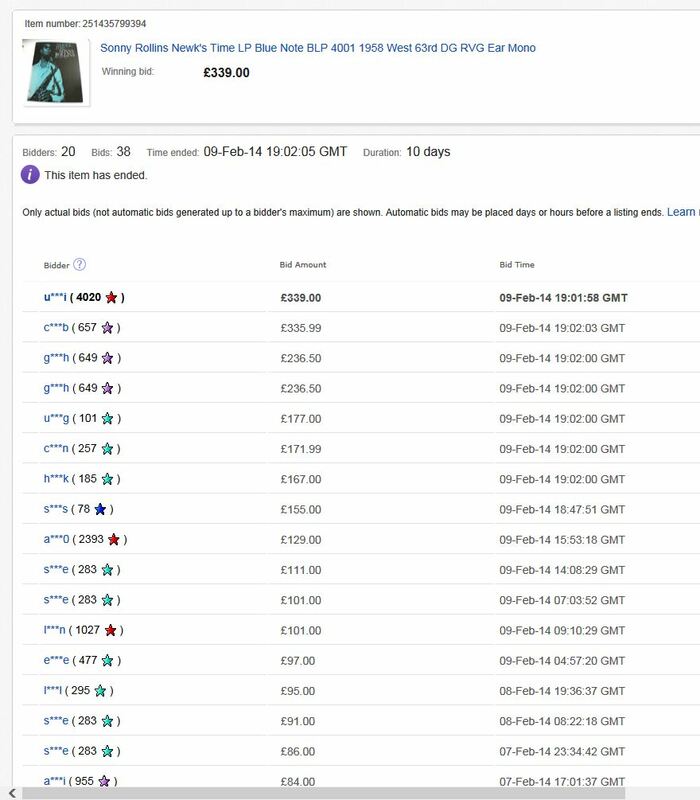 Interesting as they have no feedback and appear to have spent more than $2,000 in the last couple of days. A truly great record which is up there with Colossus for me. I have been looking for the Esquire at a reasonable price but it always evades me so I will have to make do with my Transatlantic reissue. Very unsatisfactory cover though with Rollins in a later guise – mohican – and the title 3 Giants!. Thankfully the music sounds pretty good considering they used copy tapes. Great Session. I have the Blue Trident Mono and Sonny with a Cool Mohawk on the cover. This is a great album. I’ve been puzzled that the US originals for this one don’t fetch that much. Time permitting I will do a shootout between the George Horn mastered OJC and AP 45 rpm reissue. LJC, I’m glad to hear that the new valve-based pre-amp is working well. Shame about the laptop. 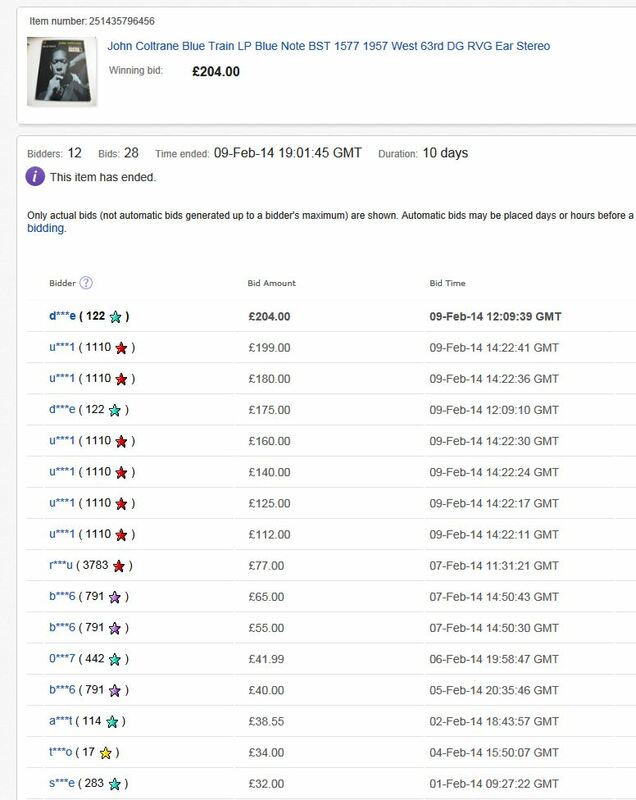 I can sell you a valve-based one if you wish and then you can get back into regular posting using an all analogue production chain. Luckily, I have a back up steam-driven laptop running Windows 3.1 that’s pretty close to analogue. I’ll just go fetch in more coal. One of the few Esquires with the original art work reproduced. Great record! Congrats. Brilliant record everyone should own. Brownie is dynamite. I have two, with both the “first” covers. I actually (slightly) prefer the Ried Miles. Anyway, enjoy this beauty! We also lost Doug Watkins on the road! Anyway, nice record! Is that really true? How much more could a Maiden Voyage be sold for?Makes me feel great about the beautiful mint copy (stereo only- but with ear), for $50. Excuse that horrible sentence. The beautiful copy I purchased for $50, is what I meant to say.